The personal and financial information you provide will be used to make a credit decision. All personal information is secure, encrypted and protected when you choose Lincoln Automotive Financial Services. If you’d like to apply for credit, it only takes a few steps. 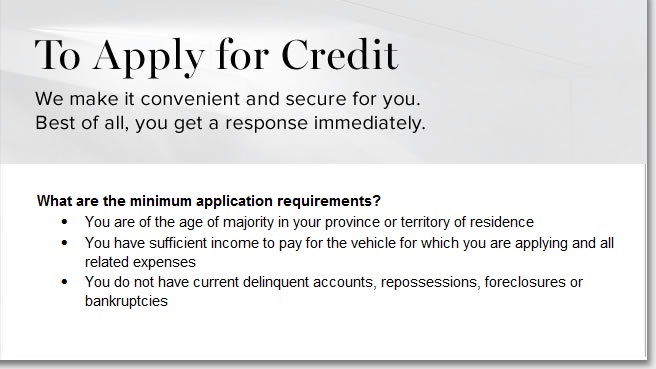 This credit application only takes a few minutes to complete. Even if you haven’t selected your Lincoln vehicle, you can still obtain an online credit decision. After ensuring your personal and financial information is accurate, submit the application and you’ll receive your response right away. Print your decision page and bring it to your preferred Lincoln Dealer. They’ll be happy to help you with the next steps.